@marycmccormack / TwitterMary McCormack filmed her husband’s Tesla Model S on fire. 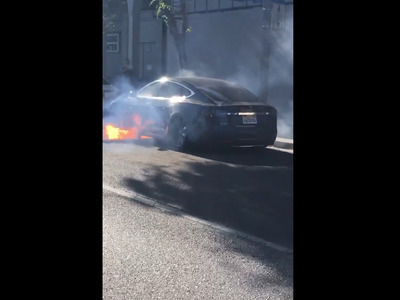 Actress Mary McCormack shared footage of her husband’s Tesla on fire in Los Angeles, California. “No accident, out of the blue, in traffic on Santa Monica Blvd,” she wrote. Tesla said it was investigating “an extraordinary unusual occurrence,” according toABC News. In a tweet directed at Tesla, actress Mary McCormack shared a video of her husband’s Model S ablaze in Los Angeles. “No accident, out of the blue, in traffic on Santa Monica Blvd. Thank you to the kind couple who flagged him down and told him to pull over,” she wrote. The dramatic footage, posted on Saturday, shows fire spewing out the side of the car. Firefighters arrived on the scene to extinguish the blaze. The “West Wing” actress specified in a later tweet that her husband’s Tesla was not on autopilot. I meant it wasn’t a Tesla with auto pilot or whatever. It was a normal Tesla. Lt. Dan Nagelmann, from the Los Angeles County Sheriff’s Department, told ABC it was either a battery or mechanical issue that caused the fire and that there was no collision. McCormack is married to British director Michael Morris, who has directed episodes of Netflix’s “House of Cards”, “13 Reasons Why”, and more.